Once again I visited the Mt. Cuba Center for their yearly Wildflower Celebration. This is a yearly event I always try to partake of. It's always neat seeing how far along things are compared to my garden back in New Jersey. This year though they were actually a week or two behind, but I've come to realize the cold winters seem to only effect certain plants. 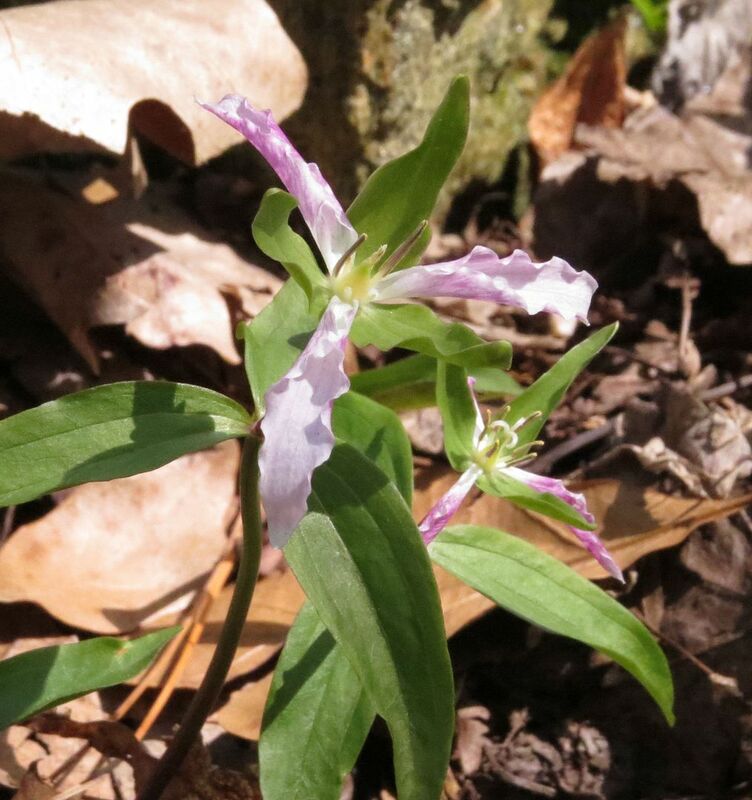 For example Trilliums were way behind from where they were last year, and they actually had a clump of twinleaf still flowering which is one of the earliest wildflowers to bloom. Most interesting of all for me was the fact they have honeybee hives setup with pollen traps to see what plants the bees are working. Now I didn't meet with the head person behind the project and I hope to change that in future. The person I ended up asking about this actually thought they were bumblebee hives.... which they are not. So my info might not be accurate. I was told the purpose is to analyze the pollen and see what the honeybees are working. Naturally this peaked my interest because I wrote a book titled "Native Plants for Honeybees." It's geared a little more for an Eastern US audience, and could probably be summarized simply by saying plant enough of something and honeybees will work it. 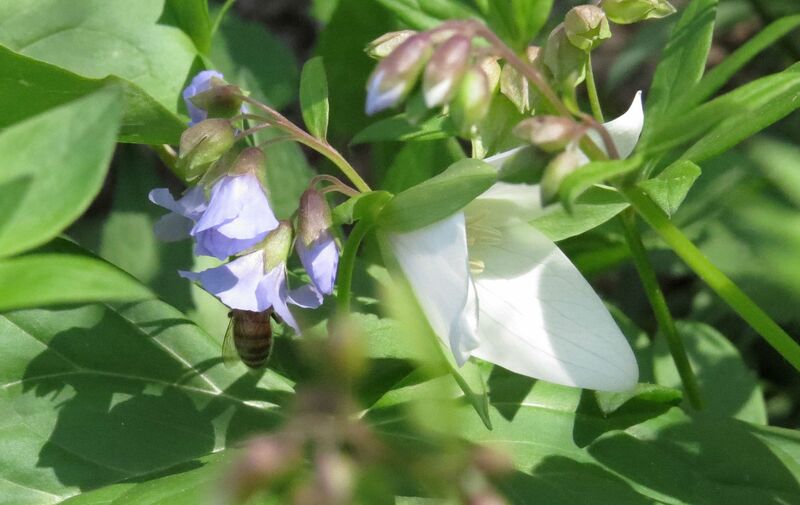 But certain plants are favored compared to others depending on what the hive is foraging for. Some plants only take a few individuals while others require a field of it to be planted to get honeybee attention. Many plants aren't even bee pollinated, and the ones that are, don't necessarily produce enough nectar to really warrant swarms of foragers, but are worked just for their pollen instead. I'll be asking more about this project and hope they present their findings at some later date as I'm eager to learn what plants they really took to at the Mt. Cuba Center. I'm expecting it to mostly be trees and shrubs at first, then a swift turn towards wildflowers as the year goes on. Right now there's probably few if any ephemerals being worked but I did notice the bees working a few there. Pollen traps are used in the beekeeping hobby/industry to collect the pollen sacks off the bees legs' as they return to the hive. 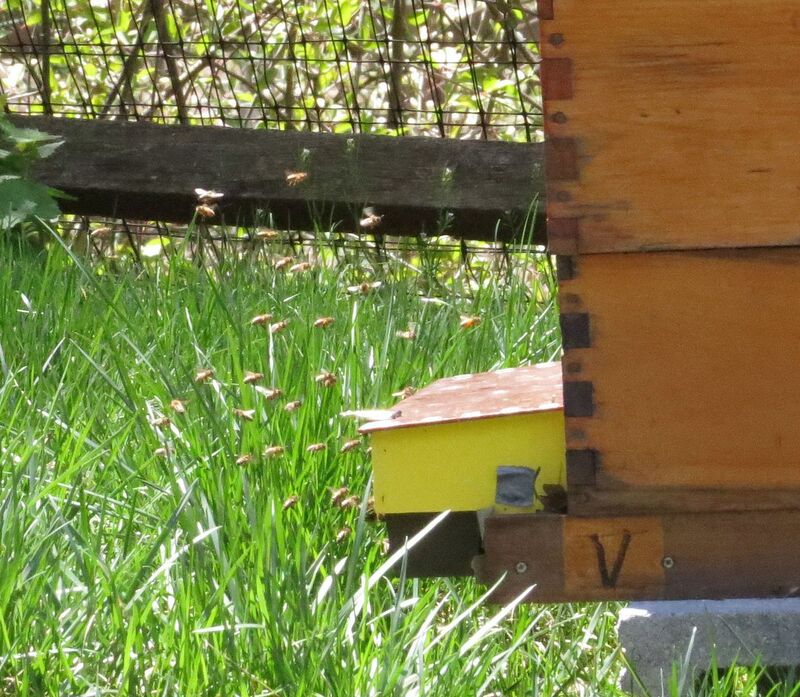 You can see one here on the front of this hive, painted in yellow. The bees enter, walk over a grate, and have to squeeze in through some tiny holes to get in the hive boxes. Bee Pollen is sold in stores, usually along side herbal remedies and supplements. People put it in their tea and the folk lore is that it helps with allergies.... instead of just taking the leading cold and allergy medicine. Put under a microscope though and you can match up the pollen to a specific genus, species, or plant family. Honeybees hate pollen traps because pollen is fed to the developing larva. Thus forcing the bees to pass through a pollen trap is taking literally taking food from the young bees mouths'. I don't use them personally but if I recall right, you can actually have a hive population crash from over using them. I think three weeks is the maximum they can be on safely but honestly with five hives, they could just as well rotate which hives have the traps on them each week. Unless the idea is to see if all five hives are working the same plants? So hopefully they're taking them off every other week or so. Alright on with the flowers. 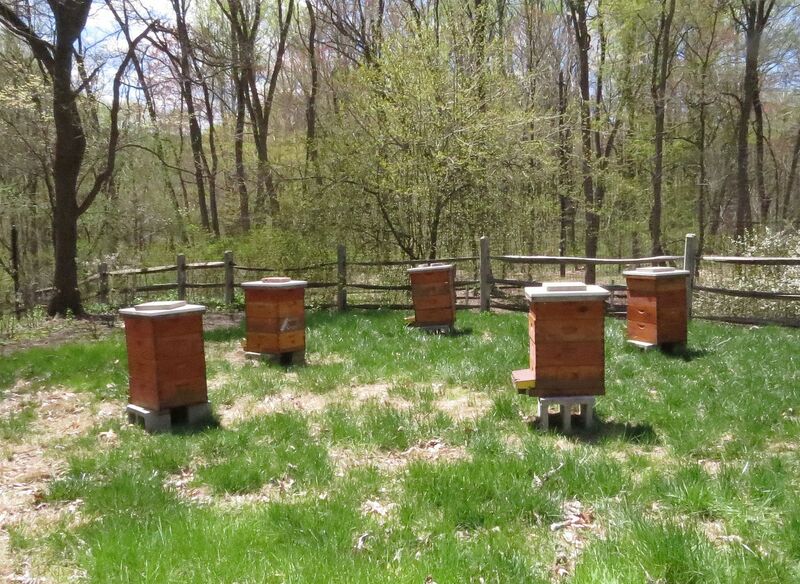 So seeing the honeybee hives was "great" because I'm interested to learn what natives they're working. Actually honeybees working native plants is not viewed as a good thing among conservationists, especially in the south western US. We have lots of native bees that specialize in pollinating specific species or genera of plants and they only work those plants; but when you throw in a hive of honeybees, they're actually stealing food from our native bees who's life cycle sinks up with the blooming of those plant species. Often the specialist pollinator brood doesn't get the nutrition it needs from different sources of pollen so its important they work those specific plants and not something else. In my book I argue another factor effecting native bee populations is habitat loss. If we had more native plants, or even just flowers in general we have more food for the bees. Natives are better because they support more native bees and have the added benefit of other native insects and are better for the environment as a while. Meanwhile, honeybees pollinate a lot of the invasive plant species that contribute to habitat loss. Find a stand of purple loosestrife in bloom and watch the honeybees go to town. They're not totally to blame though, they're a generalist pollinator and you'll see our native bumblebees working them just as hard. 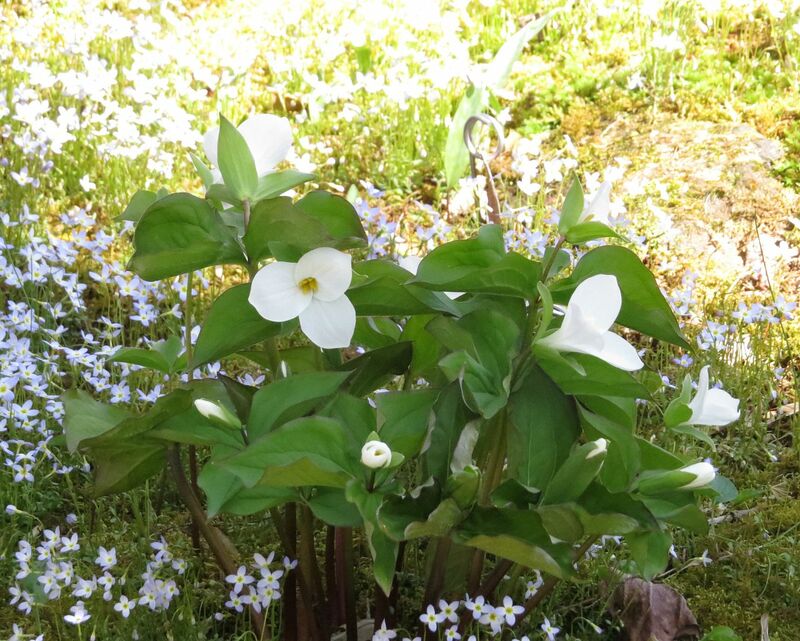 So one of the plants I had mentioned in my book was Trillium grandiflorum. This is not at the top of my list of native plants for honeybees but it is something they work. 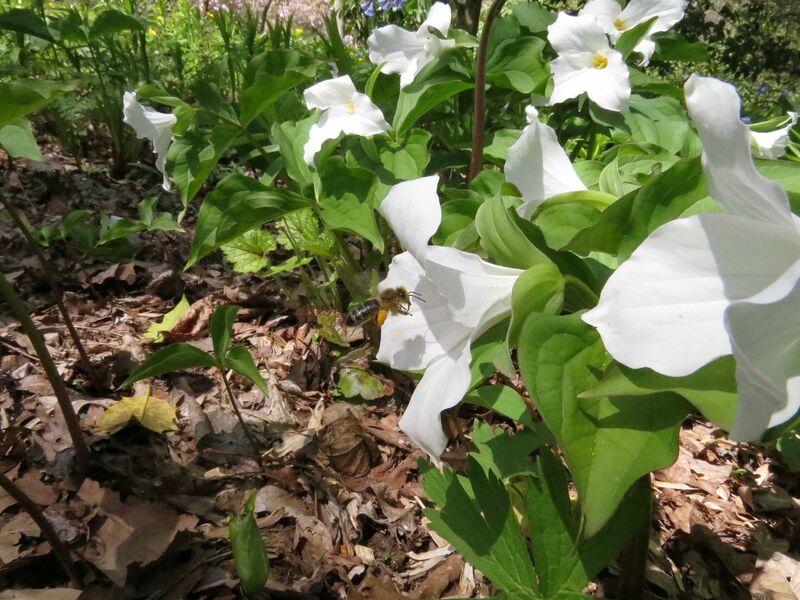 Trilliums are mono-floral, they take the better half of a decade to flower, and it takes even longer than that to get a clump or population of them large enough to get the attention of honeybees. They're in the lily family, they have a fair amount of pollen to offer, and there's even a little bit of nectar in the bottom of the flower. 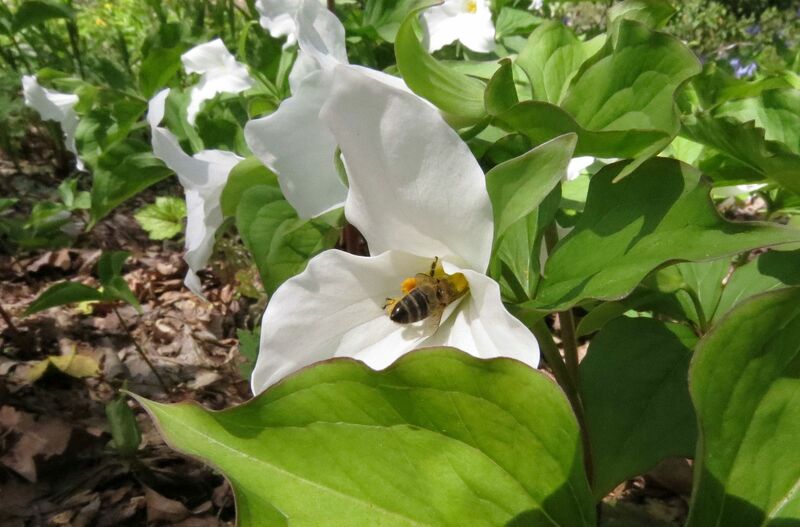 Now judging by the fact that no one has ever sold Lily Honey before, let alone Trillium Honey, it's probably just enough nectar to get the bee interested and not something a hive could stock pile. So this is really just a pollen source on par with our native roses. 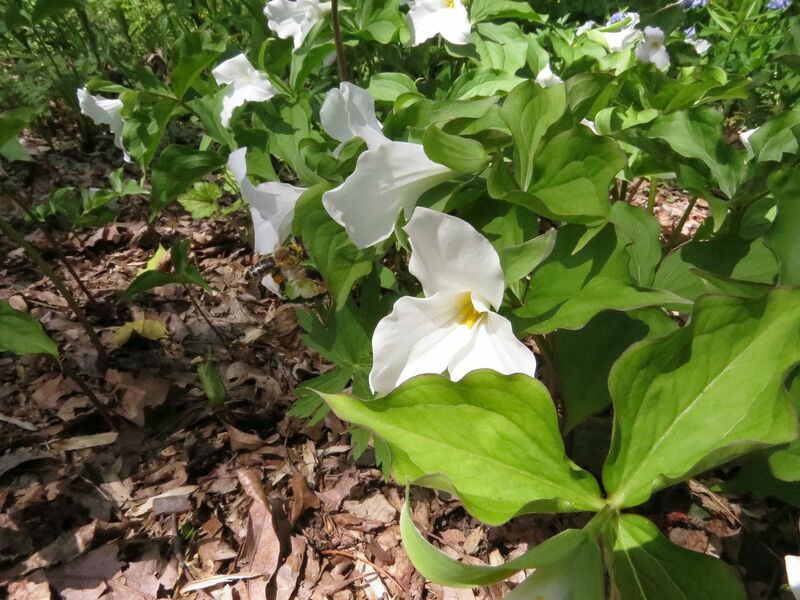 Willow trees are probably a far more superior option for this time of year, but if you happen to have a large forested area, or maybe an existing population of Trilliums on your land, it's worth it to keep them around. 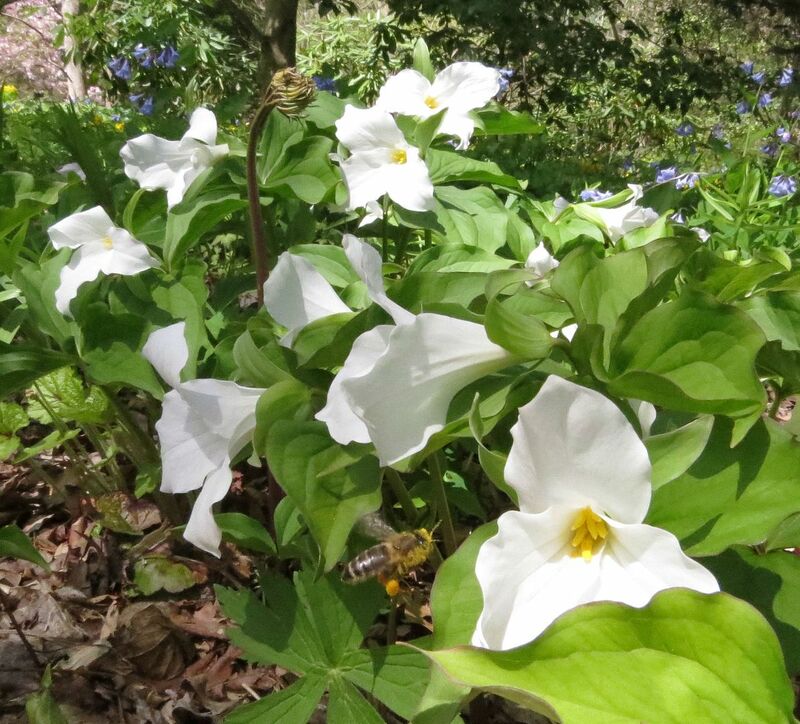 They don't work all Trillium species but they're still great plants to have around. But look at the pollen. It's uncommon to see a honeybee covered in pollen all over it's face and body. I see this usually when they work Willows, Magnolias, and Prickly Pear Cactus which are bursting with pollen. I've seen them work day lilies before but day lilies have their anthers well out from the flowers. 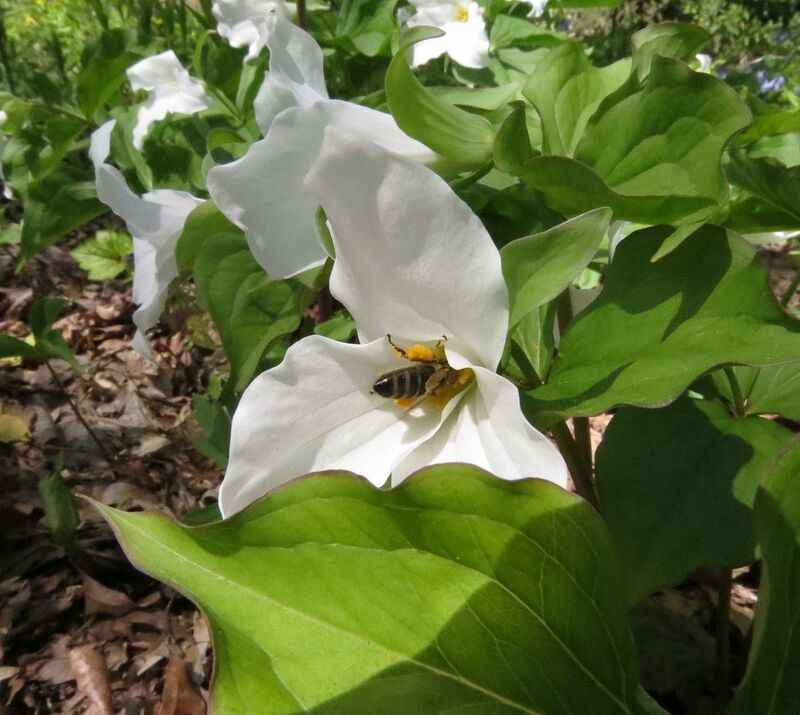 Here the Trillium's anthers are all scrunched up among the petals and it forces the bee to take a pollen bath. Those pollen sacks on the legs are going to be scraped off when she reenters the hive through the pollen trap. Roughly a year or two after they reach a flowering age, the rhizome should be able to spread apart in a few directions and send up more shoots. I've noticed this specimen in their moss and bluet patch for a few years now and it used to only send up three flowering stems each year. Now maybe five or six years later, I'm seeing it send up about 10. The clump I saw the honeybee working had about 30 flowers. They don't spread as fast in all types of soil but once they get spreading they're usually good about multiplying every year. And by then, the earliest seedlings the plant produced may have started to grow elsewhere. Ideally these plants should be covering the forest floor in huge numbers but sadly the deep population, logging, development, and plant poachers have really taken a toll on our native ephemerals. Occasionally insect and frost damage occur. 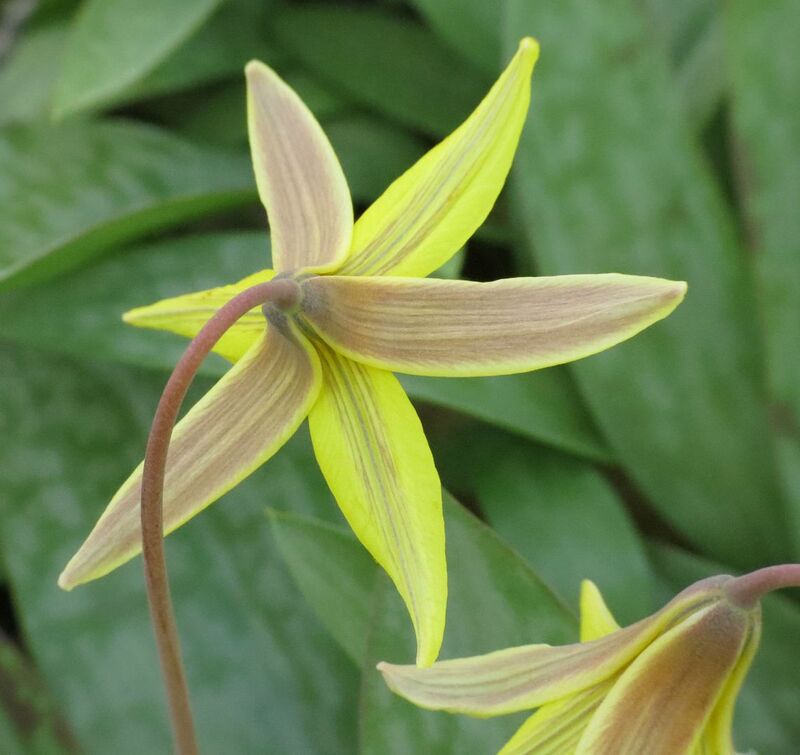 Here a T. grandiflorum's petals have become fused to the anthers creating a mess of a flower. But only 3 inches tall! 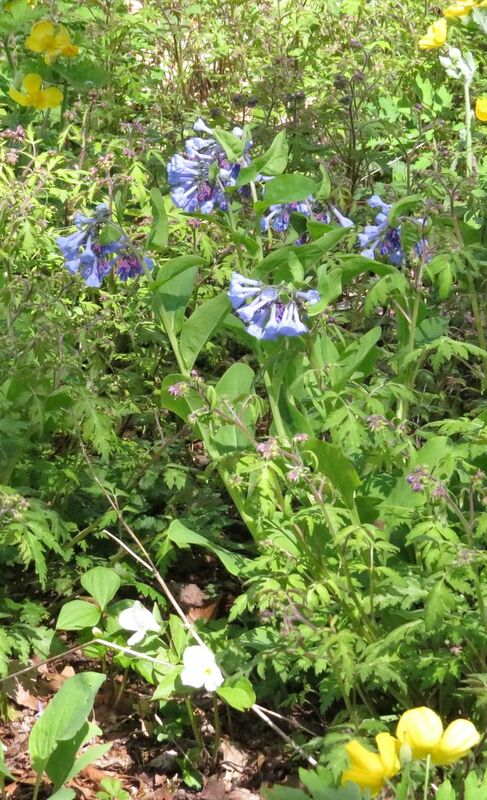 Seen here flowering at the bottom of the photo next to a knee high Virginia Bluebell which towers above them. 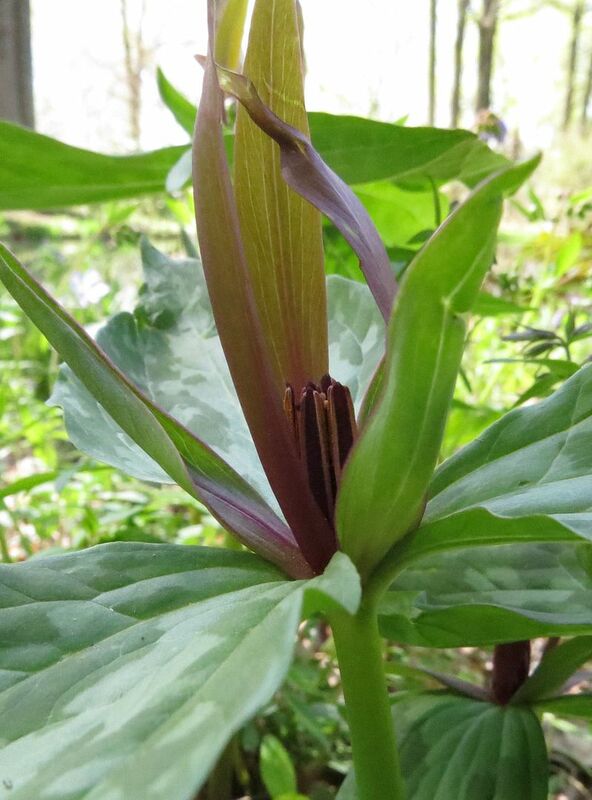 Sadly I was not early enough to see Trillium pusillum flowering at its peak though. They actually do look very pretty when they first open. Give them a week though and the petals are quick to shrivel up and turn magenta. Even with the added color, they're surprisingly easy to miss, and their small size doesn't help. The Mt. 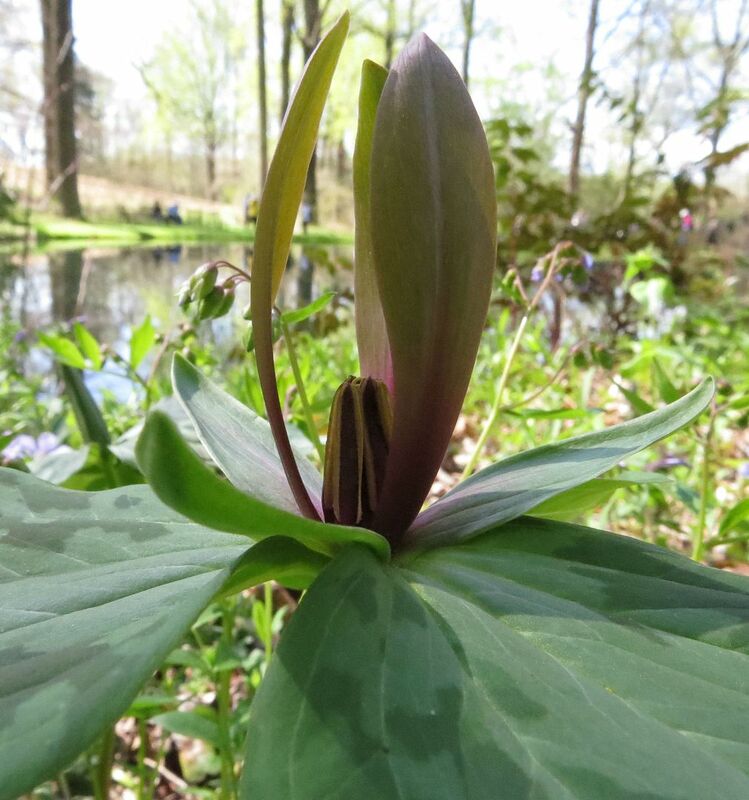 Cuba Center has a number of Trillium hybrids on display, only one of which was flowering on that day. 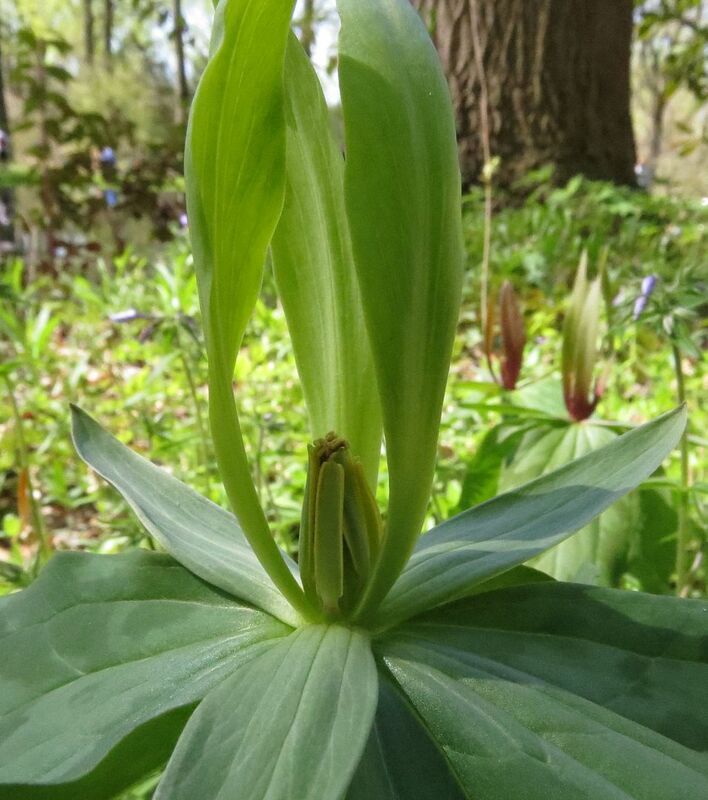 Trillium flexipes x erectrum. Due to their slow rate of reproduction, populations of different species have become isolated from one another. When grown together though, perhaps in a garden setting, it seems some species are better able to hybridize with one another. This specimen isn't the robust red of T. erectum, and it has the cream white stigma of T. flexipes, which should otherwise be completely red! 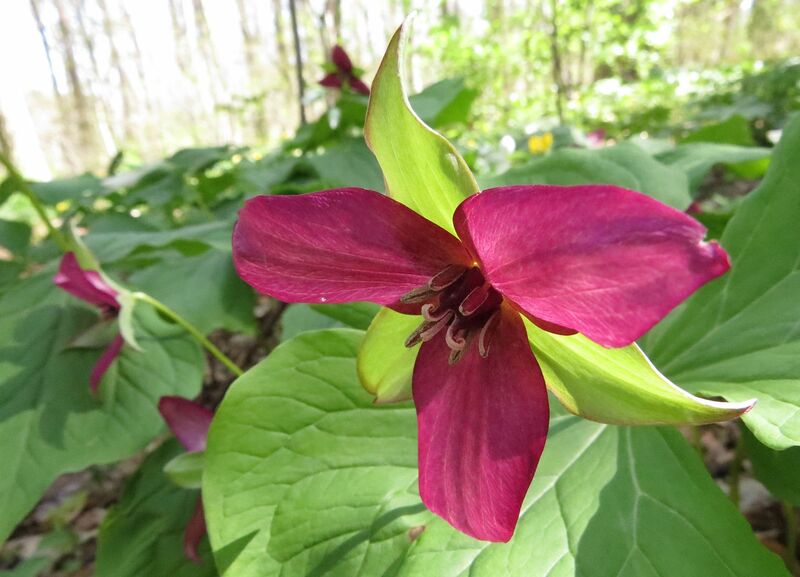 The true species of Trillium erecturm is a robust red color (though this one is hinting a little magenta) and has a solid red stigma. The flower also wreaks of rotting fish; thankfully one has to practically stick their nose inside the flower to observe this fact. They're pollinated by carrion beetles and flies. Woodland Poppy, Stylophorum diphyllum, is another of our native ephemerals who's seeds are spread by ants. 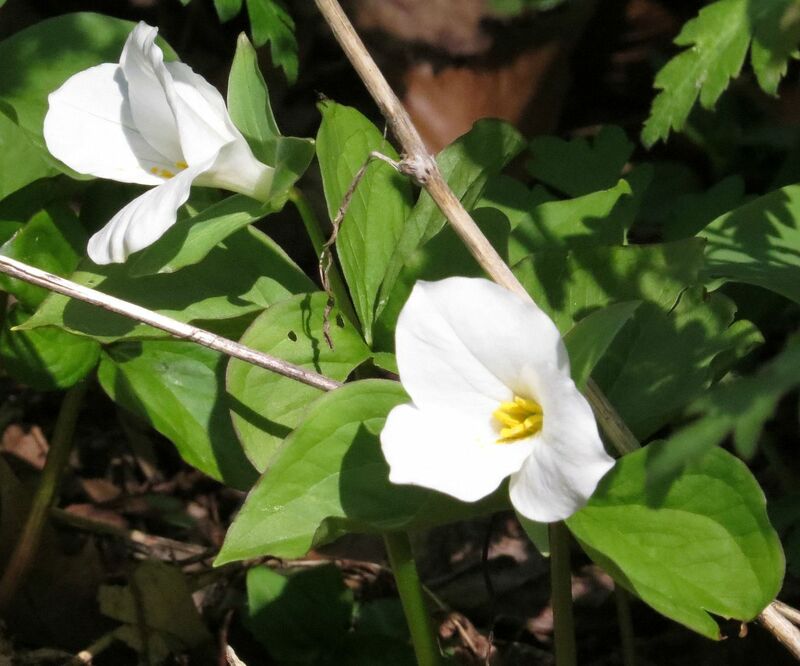 Unlike Trilliums and Trout Lily, and pretty much all the others that spread their seeds this way, this is perhaps the easiest one to grow and spread by seed. Unfortunately, being a member of the poppy family, the flowers only produce pollen and nectar is too insignificant for honeybees to bother with. 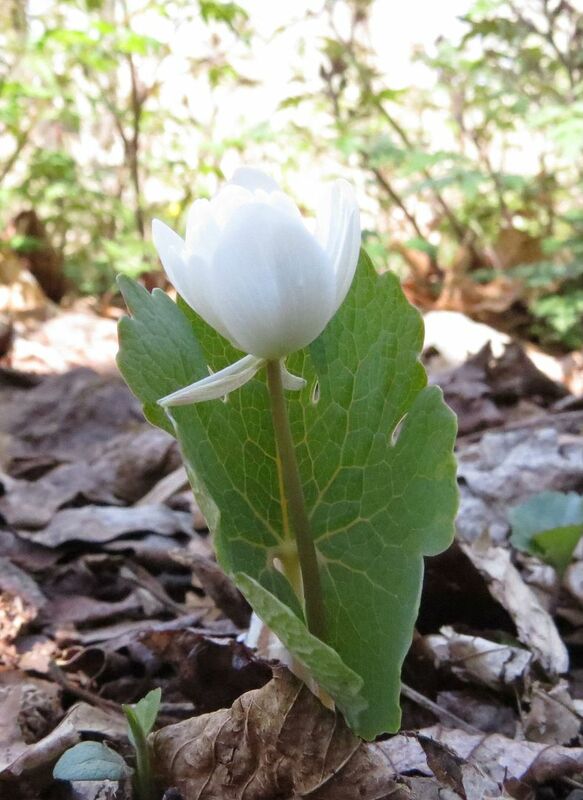 But it's another easy plant to cheer up the forest floor each spring. 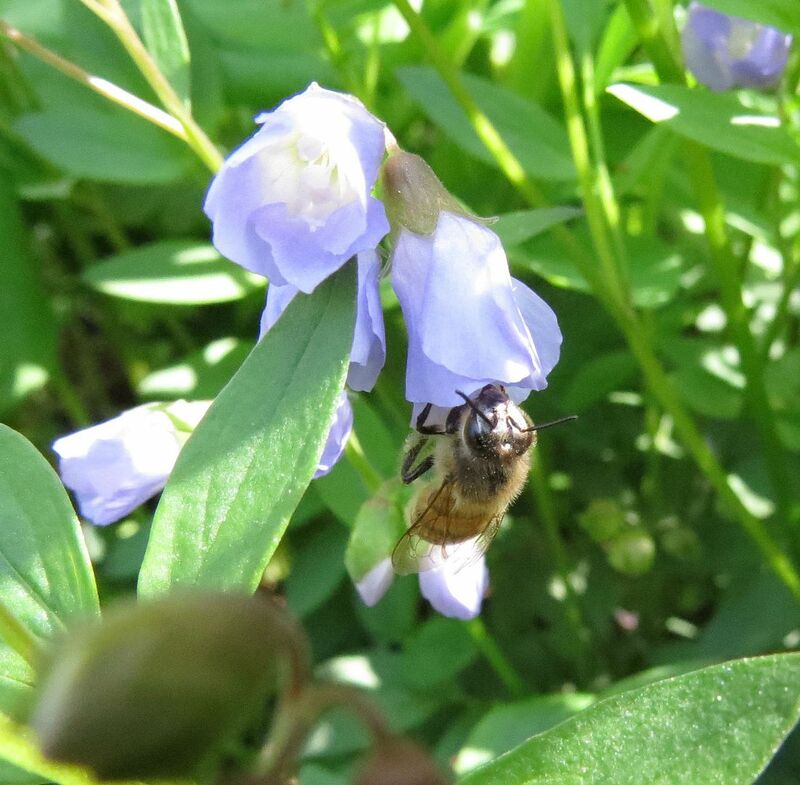 Jacob's ladder, Polemonium caeruleum, now this is another ephemeral I noticed honeybees taking an interest in. Honestly I'm not sure about the nectar to pollen ratio. Plants that produce large quantities of nectar (that are easy to get at) are always favored by honeybees which is why they love the mint family so much. This is in the Jacob's Ladder/Phlox family though so I'm not sure where it falls. Honeybees don't seem to work Phlox so this was a neat find. 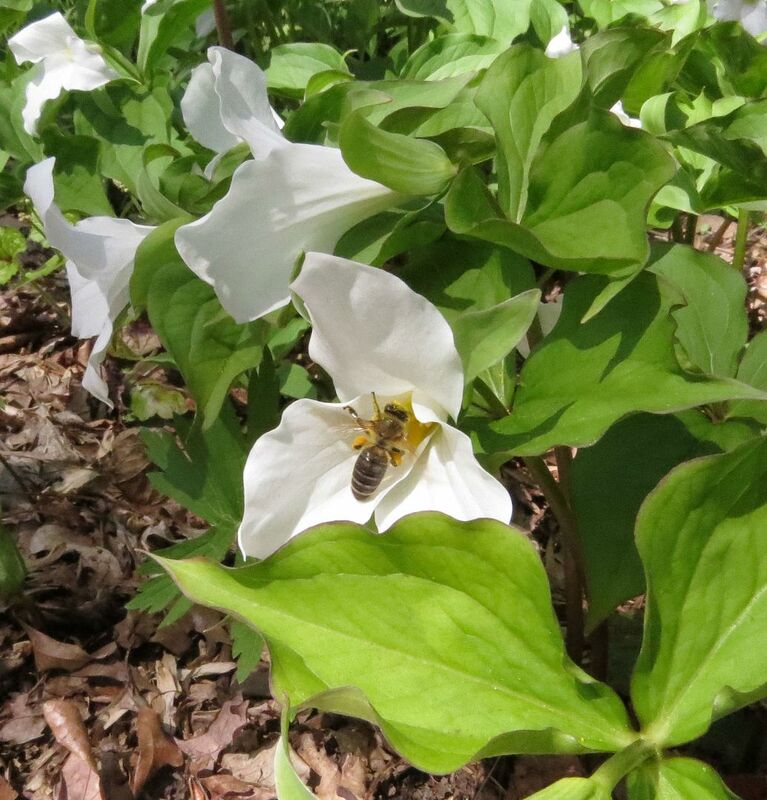 Also note the cream white Trillium flexipes in the photo. 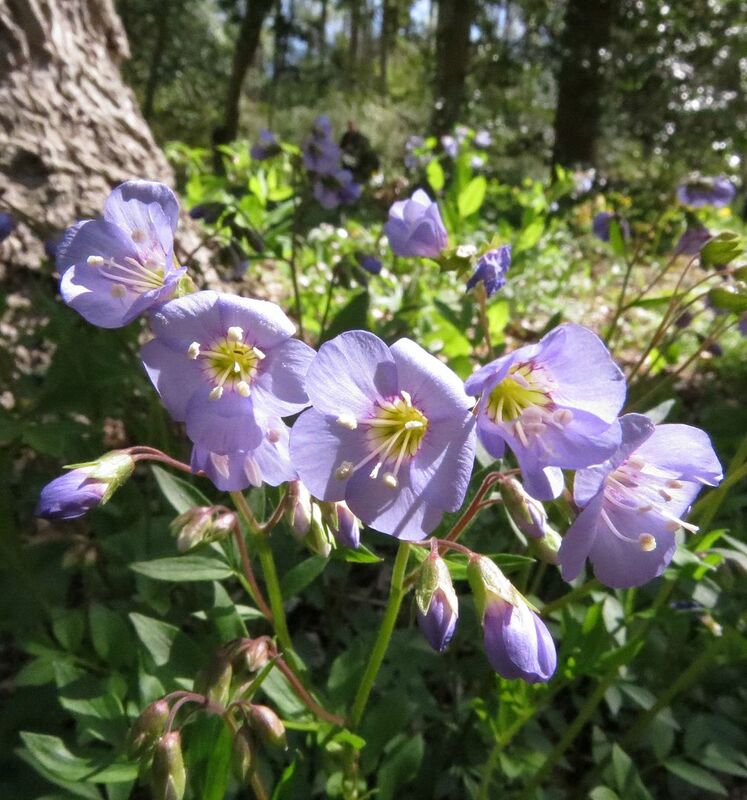 Jacob's ladder, Polemonium caeruleum. Occasionally flowers hue more towards purple than blue. The honeybees were making good use of the pond at the Mt. Cuba Center, as were the frogs. 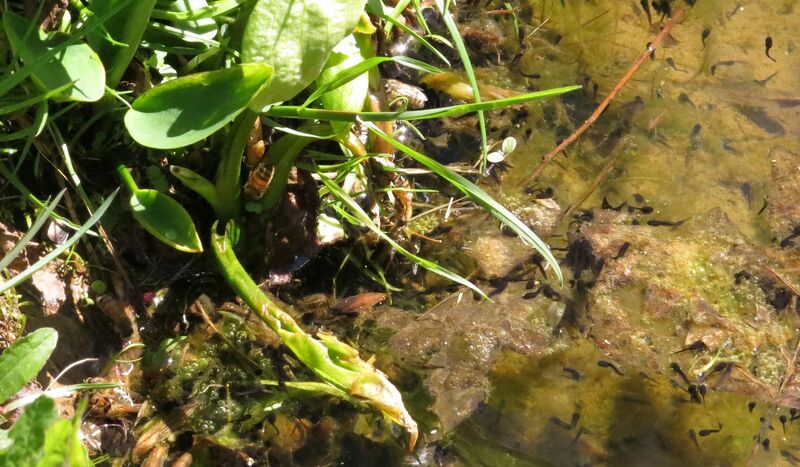 Thousands of tiny tadpoles were wriggling about along the edges. 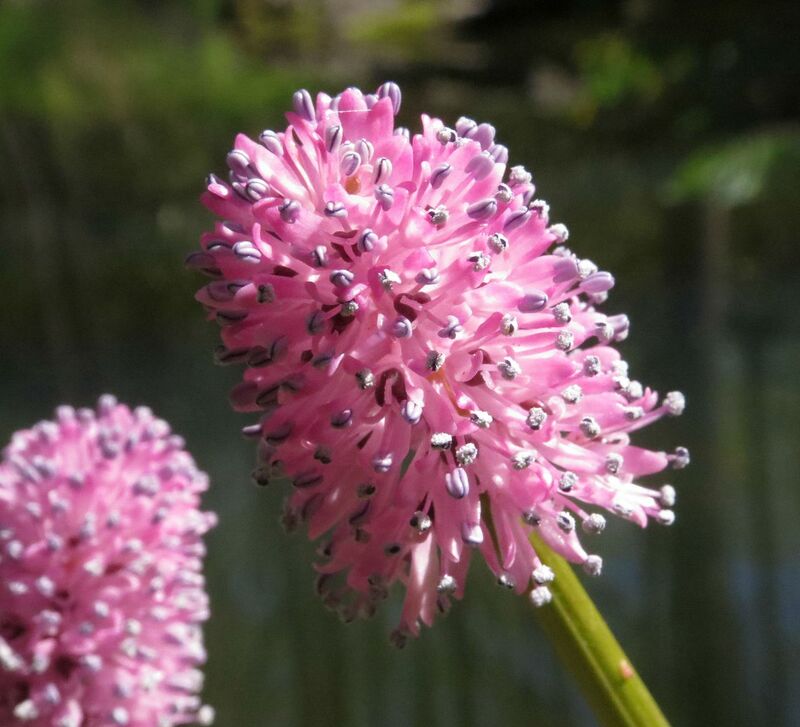 I got to see Swamp Pink, Helonias bullata, flowering. 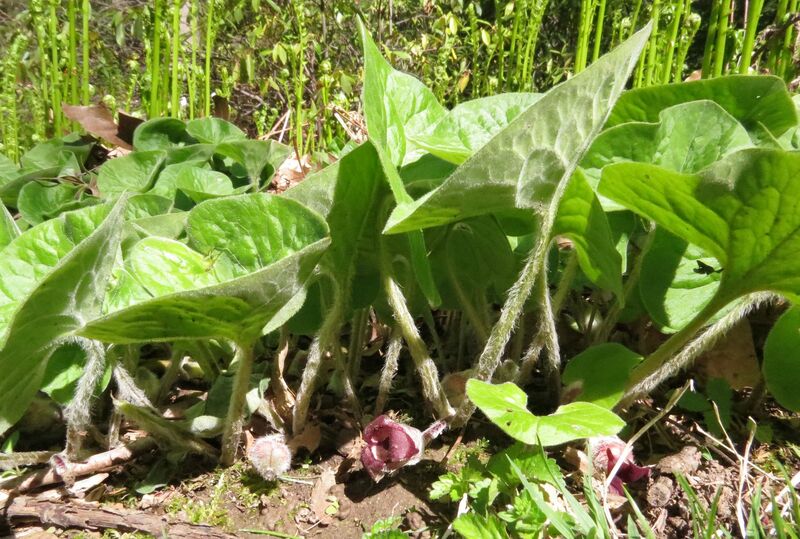 This is a rare and threatened species native to the bogs of New Jersey and a few other locations along the east coast. The deer treat these flowers like cotton candy. 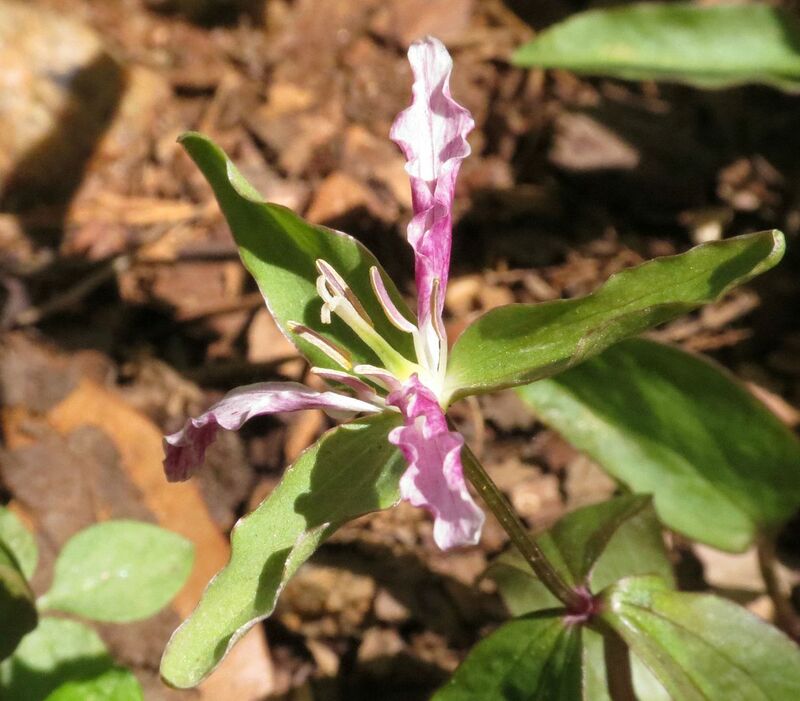 Ozark Green Trillium, Trillium viridescens, is easily identified by its bicolored petals which are rarely all purple. Often the tips are green and they transition into a darker maroon-purple farther down, sometimes abruptly so, but also as a soft transition as seen here. This species is pollinated by vinegar flies (called fruit flies by pet stores). As the sun starts to go down, the flower produces smell somewhere between cyder and rotting apples and this draws the flies right to the flower. Their simple walking around causes them to tread over the pollen anthers and as they fly from flower to flower they pollinate the plant. 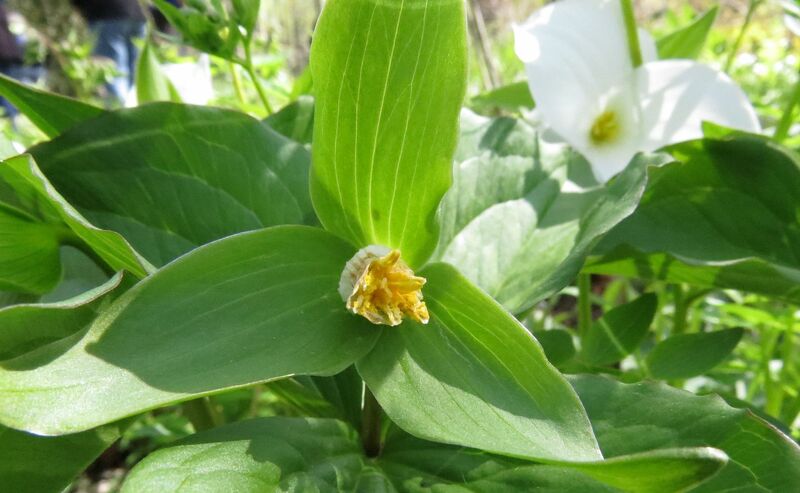 Yellow Trillium, Trillium luteum, have green petals when they first open. 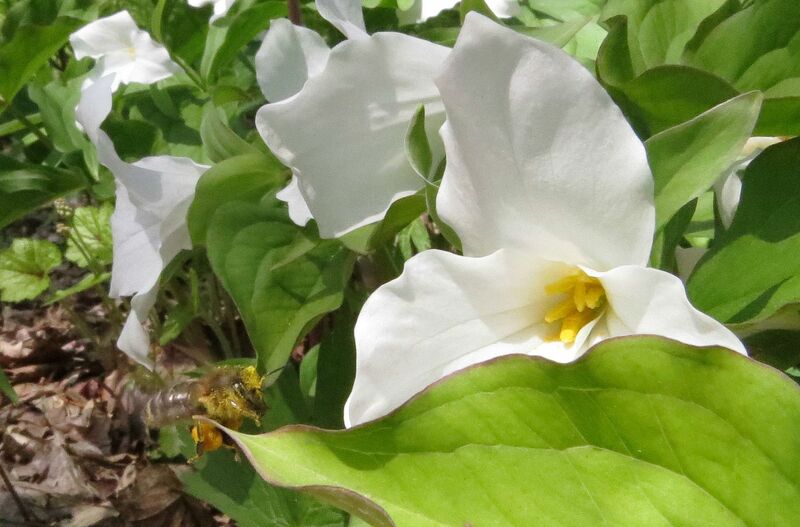 They slowly turn yellow over the course of two weeks, and unlike Trillium viridescens (seen in the background) they produce a pleasant lemony scent. To be honest, I'm not certain what pollinates this species but I'm sure the fragrance has to be produced for a purpose. The forest floor at the Mt. 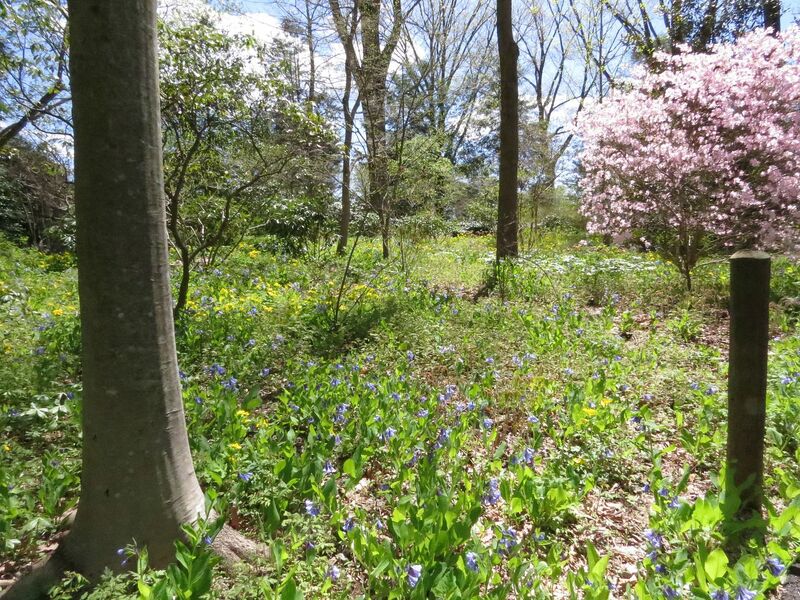 Cuba Center is coated in a default of Virginia Bluebells, Woodland Poppy, Fernleaf Phacelia, and occasional patches of Woodland Phlox, Jacob's Ladder, Bellwort, and Foam Flower. 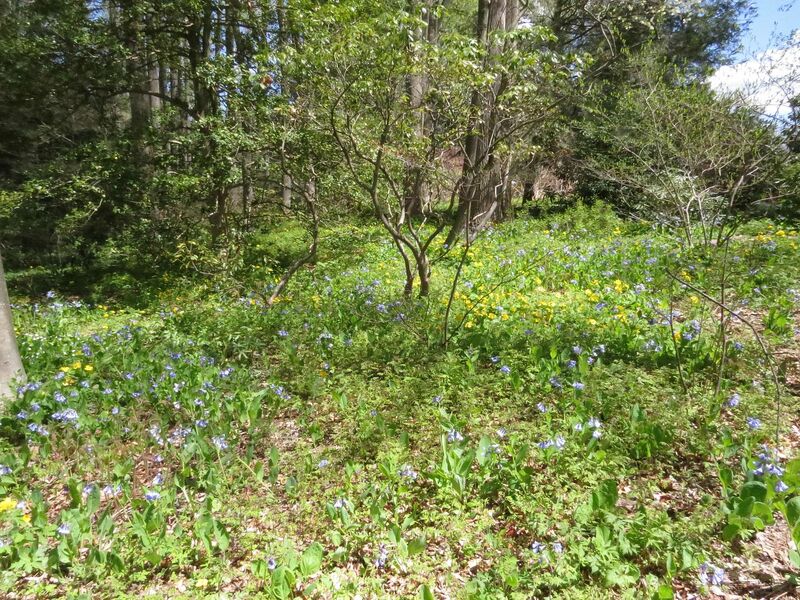 There's a scattering of Ferns and Heucheras and populations of native Iris, Bloodroot and Trout Lily. 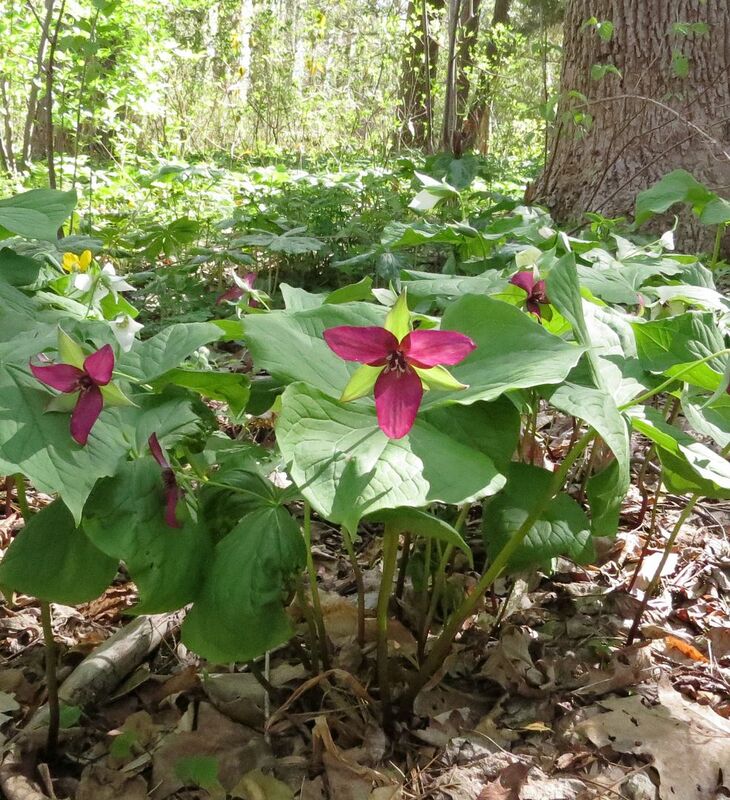 Trilliums and other specialty plants act as accents as they're harder to reproduce in good numbers among the shrubs and trees. Someday I hope to grow enough of these plants to make my own seed mix. What's crazy is this isn't even at its peak bloom. The Fernleaf Phacelia really fills in the gaps with vast carpets of purple flowers. I hope to revisit them in a week and hopefully they'll be flowering. 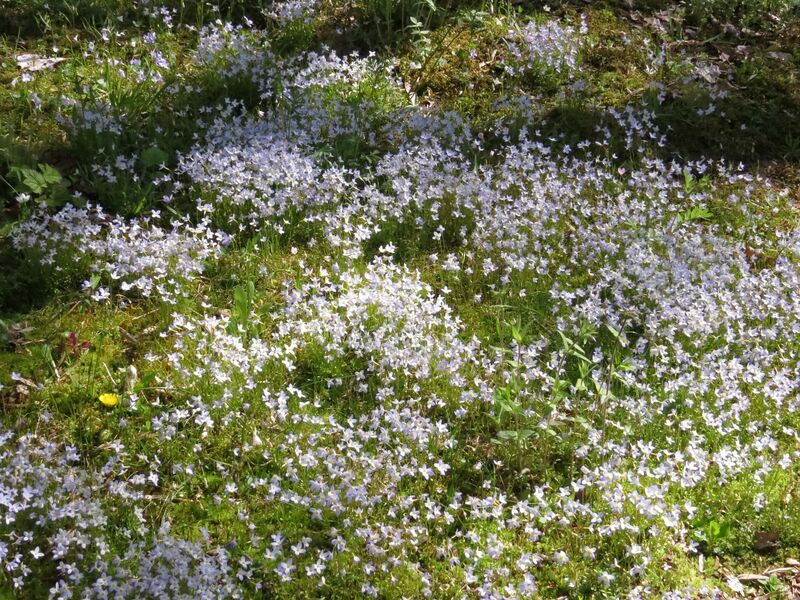 Also forming a carpet of cloud-like flowers are Quaker Lady Bluets, Houstonia caerulea. When grown in mass and seen from afar almost create the illusion of a recent snowfall. In years past, I had noticed the population had petered out. I believe they transplanted loads of them to other locations in the garden where they've since started to spread. This is pretty close to where it was the first year I saw it. 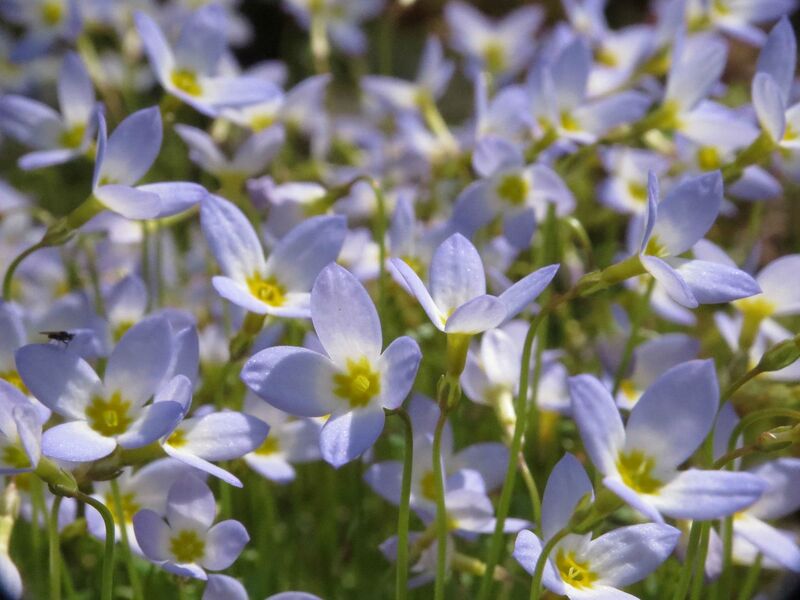 Bluets always amaze me because they're such a tiny plant. Really they're just a rosette of leaves you could fit on a quarter. Each one goes on to produce twenty or forty flowers though that run the risk of shading themselves out. They're pollinated by tiny flies and beeflies (which you sometimes see working butterfly bush). 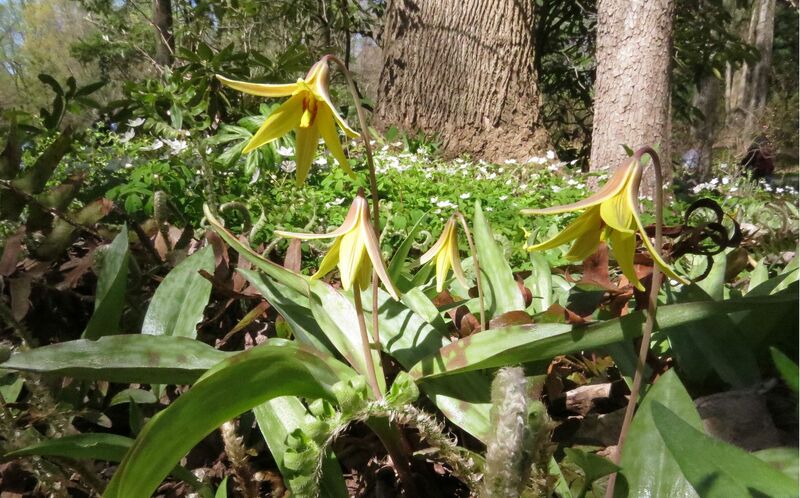 Typically the Trout Lilies are done flowering by the time the Wildflower Celebration is held. This year they were at peak bloom. 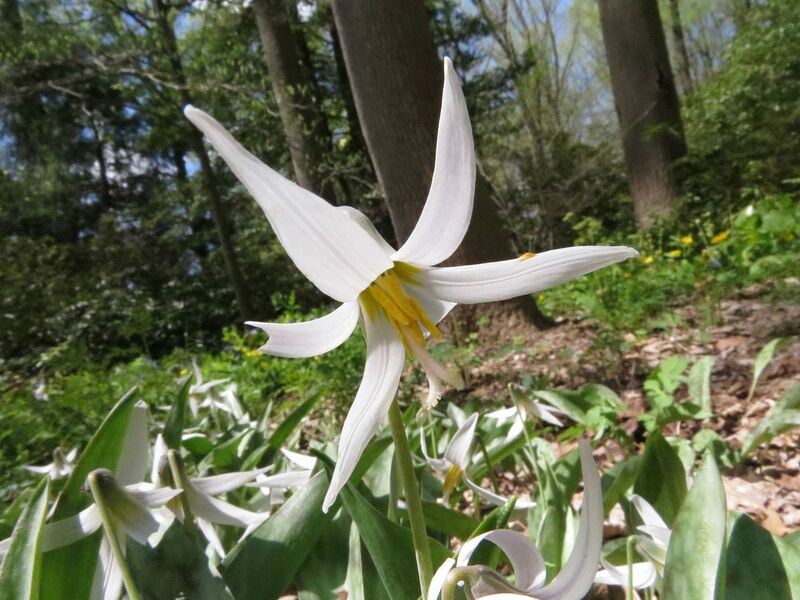 White Trout Lily, Erythronium albidum, has a beautiful star shaped flower... when it's open. 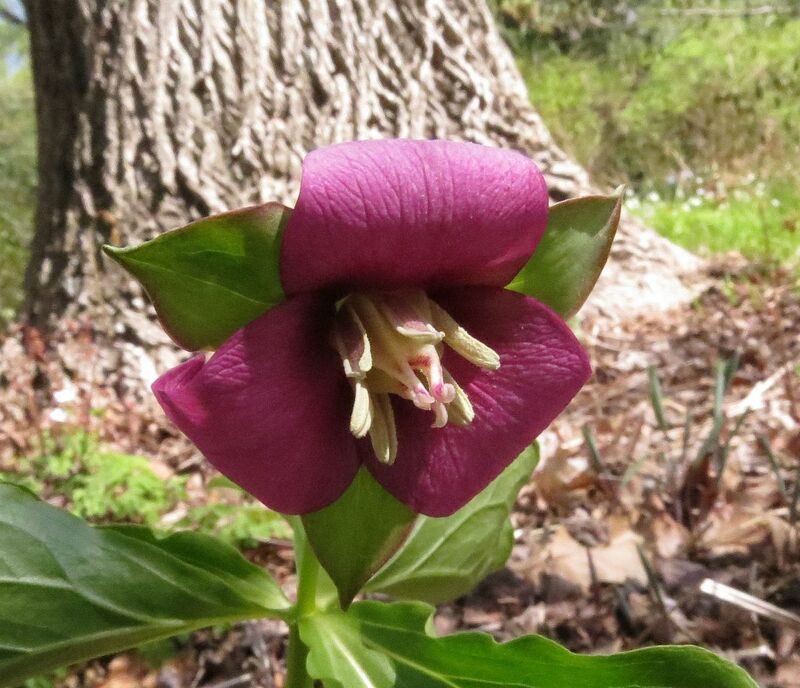 Flowers only open up when in full sun and are quick to close up on cloudy days or night fall. This is a wildflower probably best seen in the wild. Garden plants rarely produce flowers because they're a little finicky. I've been told it's best to plant them on top of rocky soil, or buried stones, because the ones that flower in nature are the oldest members of the population. Populations favor reproduction by division and only produce a single leaf each year. It's only when a plant has made a massive tap root that they bother to flower. Growing them in containers might also work too, but I've never tried this myself. 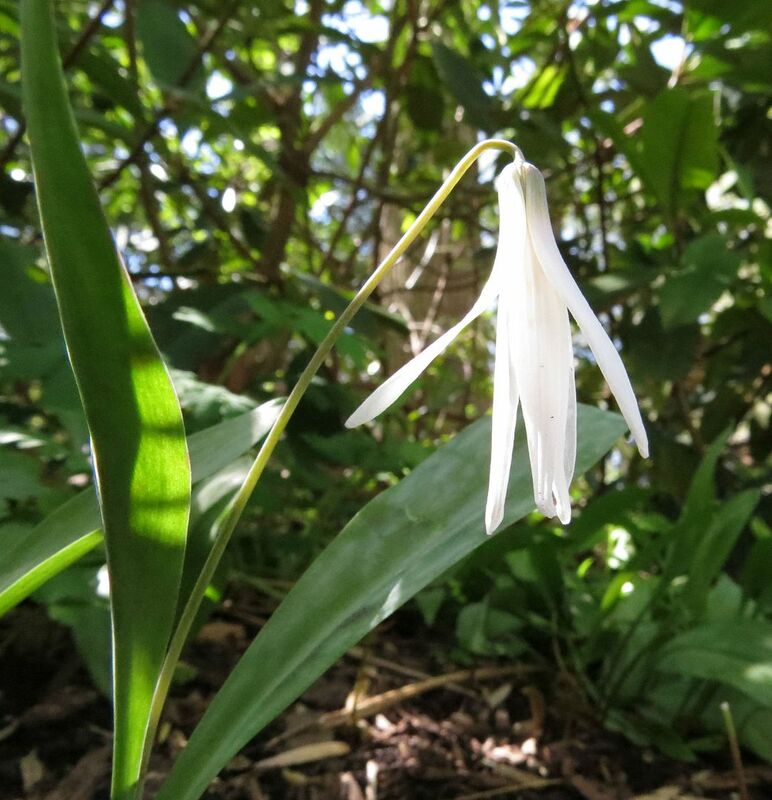 This Trout Lily isn't getting enough sun so it's starting to close its flower for the day. 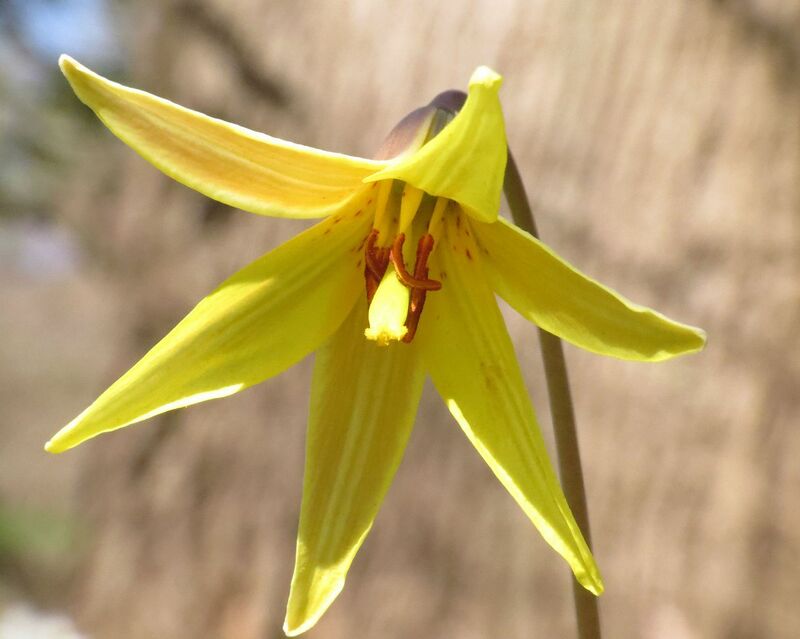 Yellow Trout Lily, Erythronium americanum. This is another ephemeral honeybees will work, but I didn't see any taking any interest to them on that day. 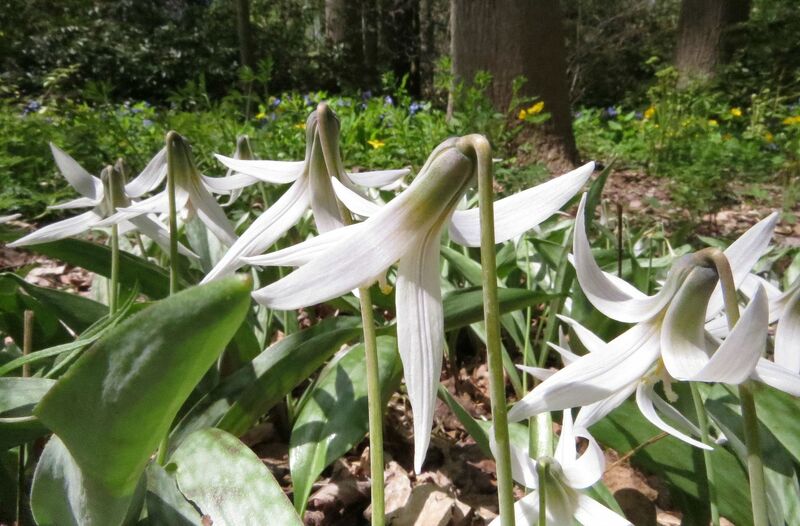 When viewed from below, it's easy to see why this is considered a lily. The bright flower is to entice insects in to pollinate the flower. Later in the year, a seed pod will form at the end of the stem and slowly lay on the ground. Seeds are coated in elaiosome which entice ants to take them back to the nest where they're planted in the soil. Despite aiming their flowers towards the ground, they can be pretty to look at from behind as well. 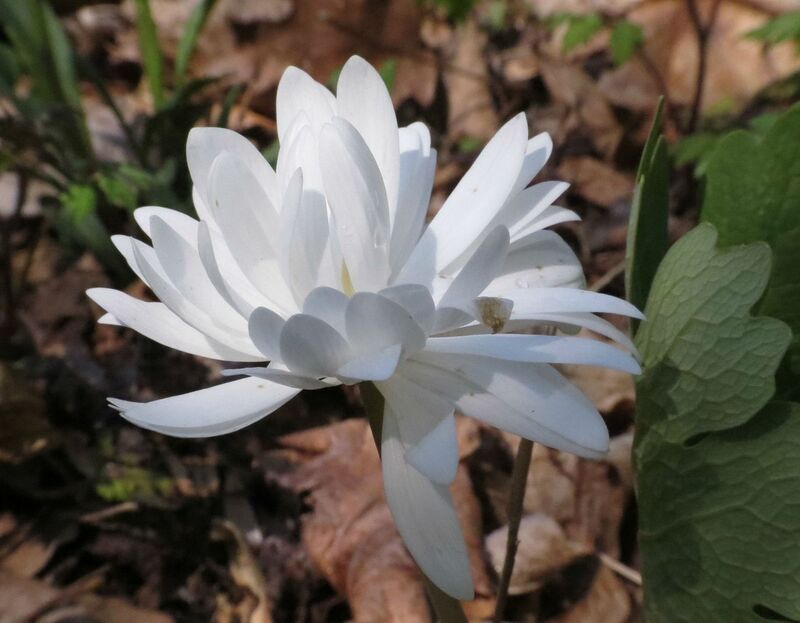 Blood Root, Sanguinaria canadensis. 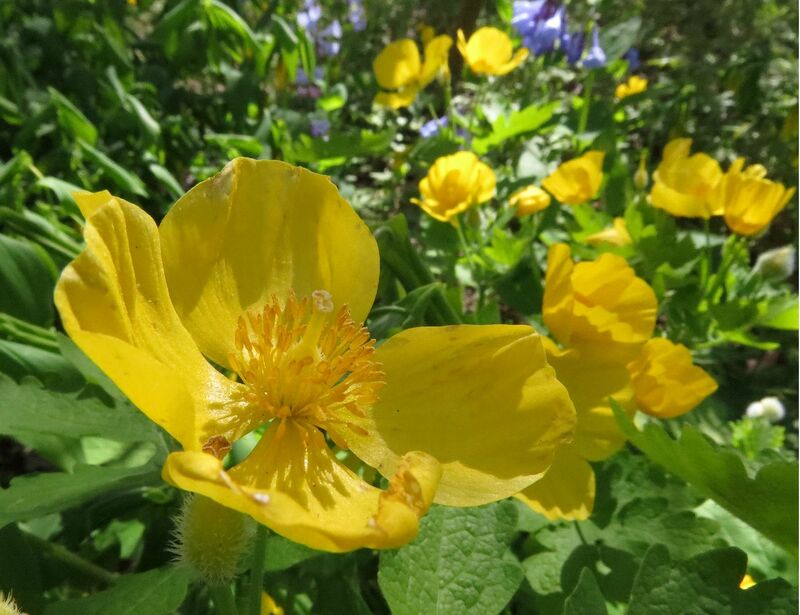 This native poppy pushes up its flower with the leaf clasping the stem before unfolding. Flowers are a tad quick to shed their petals however, which is why double flowering varieties can be popular among growers. Pictured here is the single flowering true species. This is a double flowering variety. 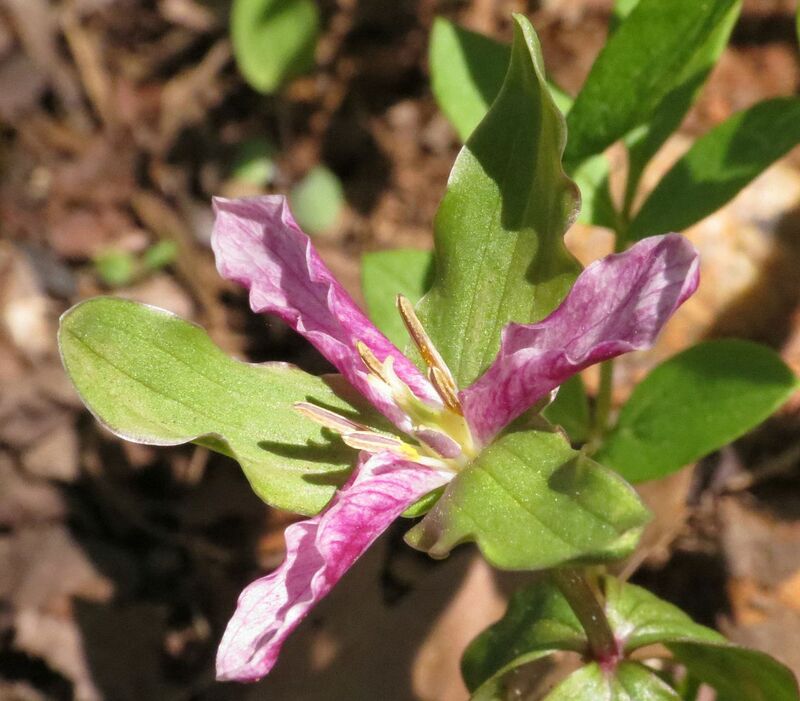 This plant has produced more flower petals than typical in place of reproductive parts, usually the pollen anthers. Typically double flowering plants produce fewer seeds. 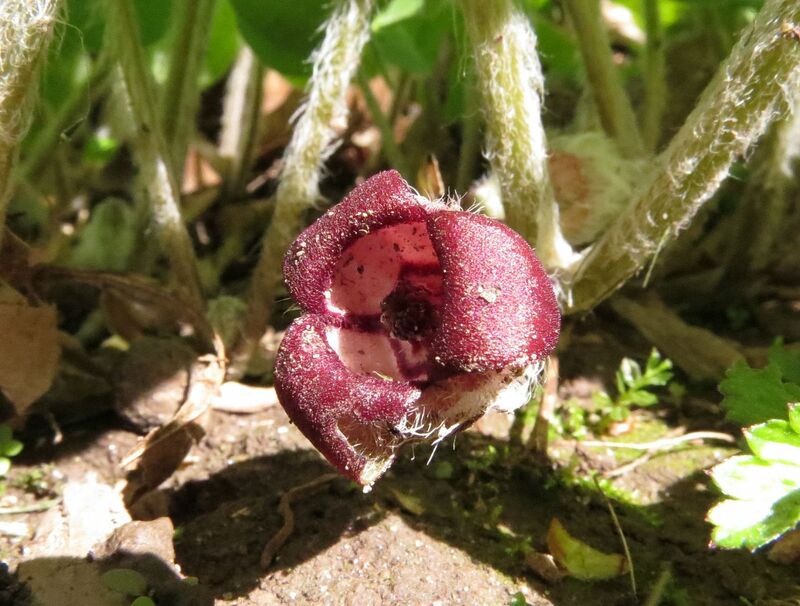 Wild Ginger, Asarum canadense, grows to form a thick ground cover of leaves. 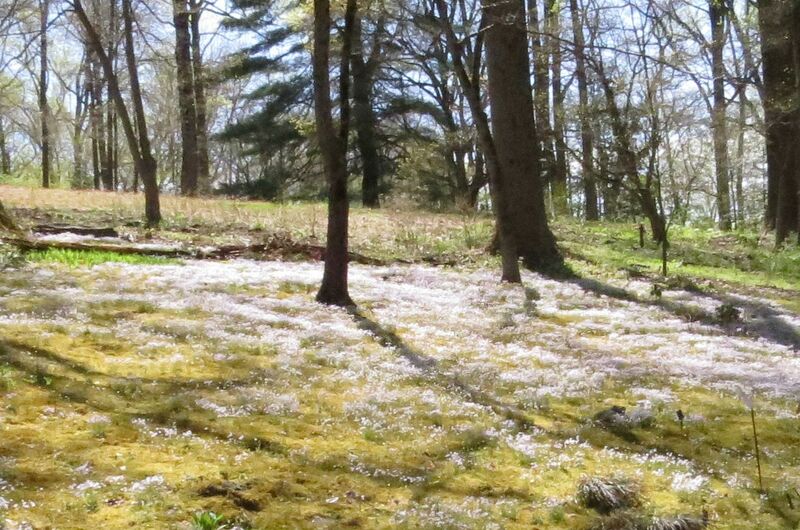 Look beyond this dense of mat in the early spring though and you'll likely find the flowers each plant produces. 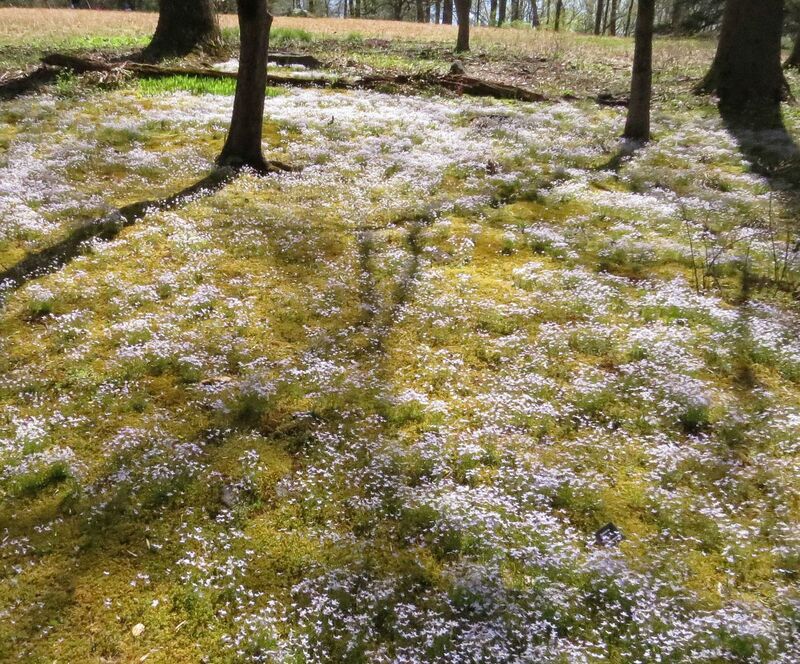 They're pollinated by flies and carrion beetles, thus the flowers are not showy and simply lay on the ground. Later on seed pods form and split open so ants can take the seeds back to the nest and plant. This can be an aggressive spreading plant though, and often seedlings don't require the aid of being planted by ants to germinate. 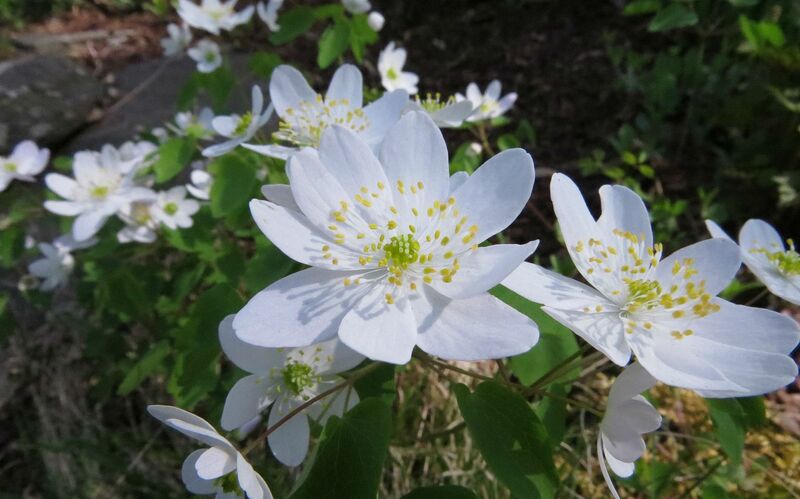 Rue Anemone, Thalictrum thalictroides. These only produce pollen, and while honeybees can work them, they're not always at the top of the list. Honeybees work hard and they'd rather put their efforts toward a plant that at least gives them a little bit of nectar. 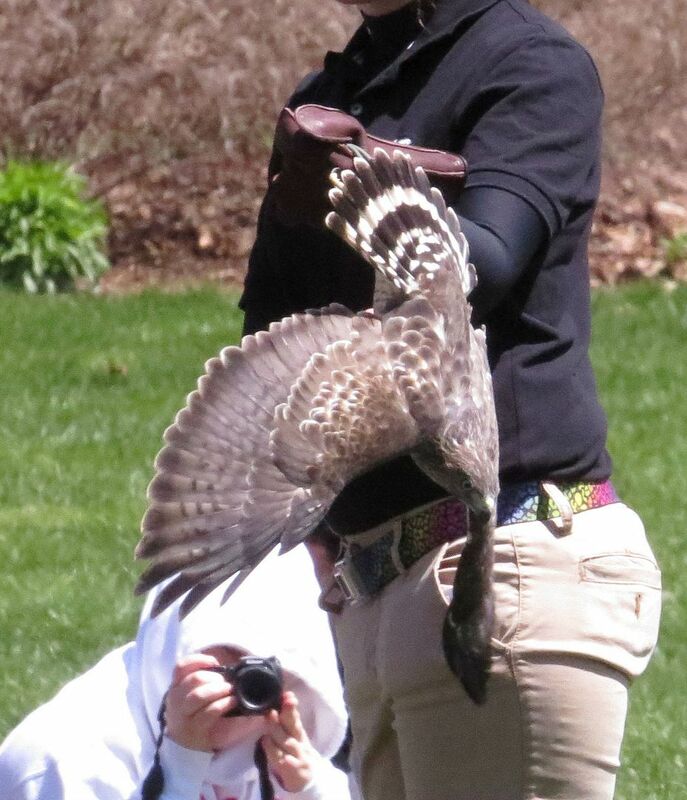 And of course their has been the great addition of the raptor bird demonstration that I look forward to every year. 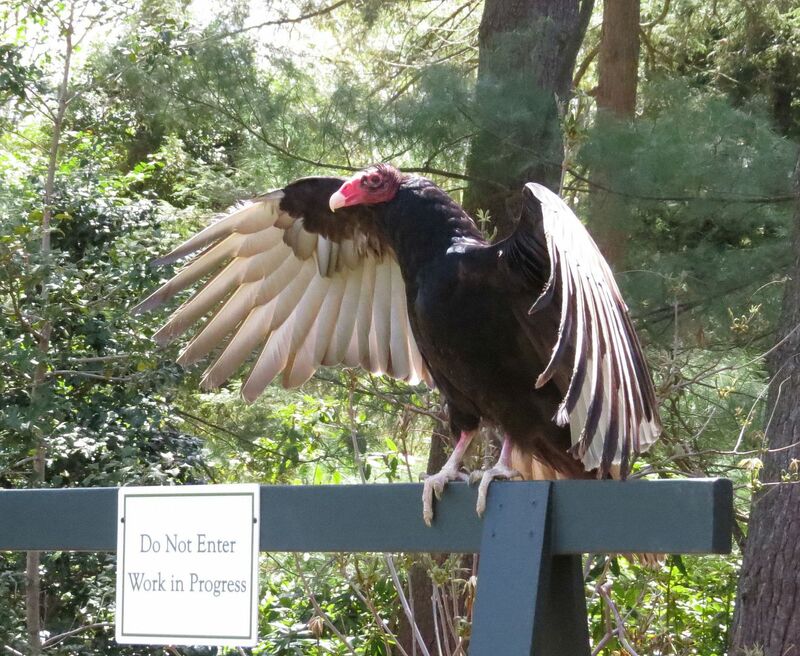 Here a Turkey Vulture was sunning itself on a Do Not Enter sign... I did not enter. Actually this was a brief moment I managed to capture. All the birds are rescues that would otherwise be put down due to injuries (some mental and some physical). Some of the birds were hit by cars and unable to fly, others were illegally raised as chicks found by people who didn't think to call someone about it. The majority of the birds there didn't fly and were simply shown for educational purposes, which is more enjoyable than it sounds. 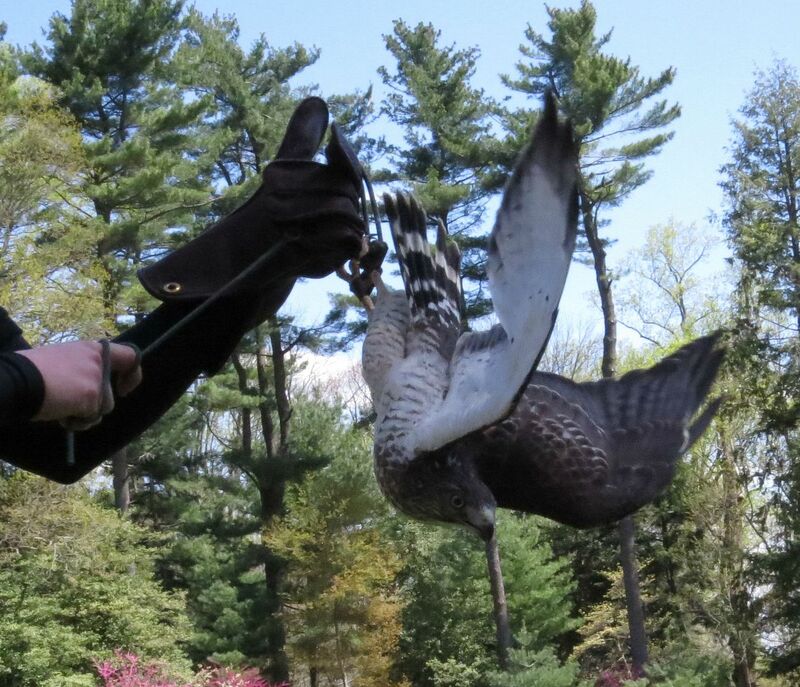 Unfortunately I'm not a bird person and they had like three different types of hawks there. 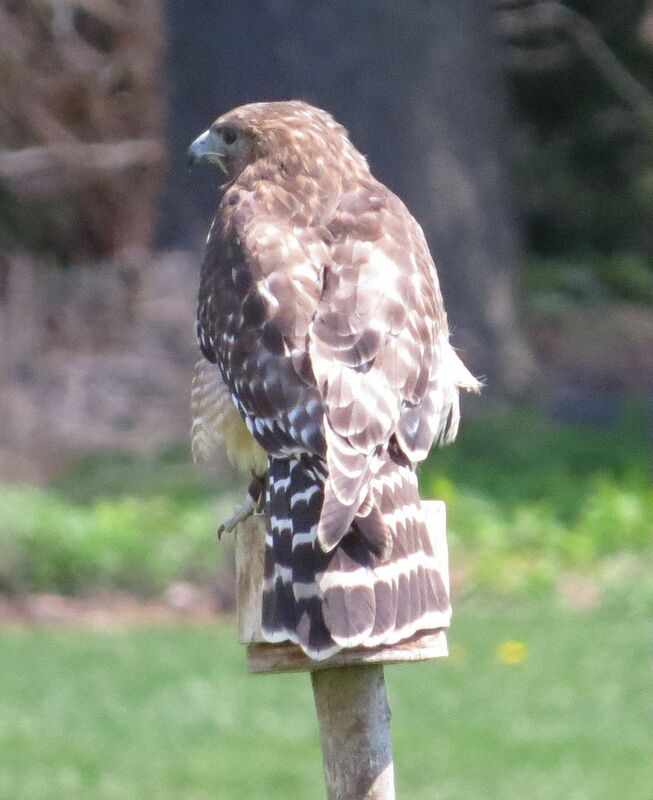 I know this isn't a Red-Tailed but it was one they allowed to fly around. 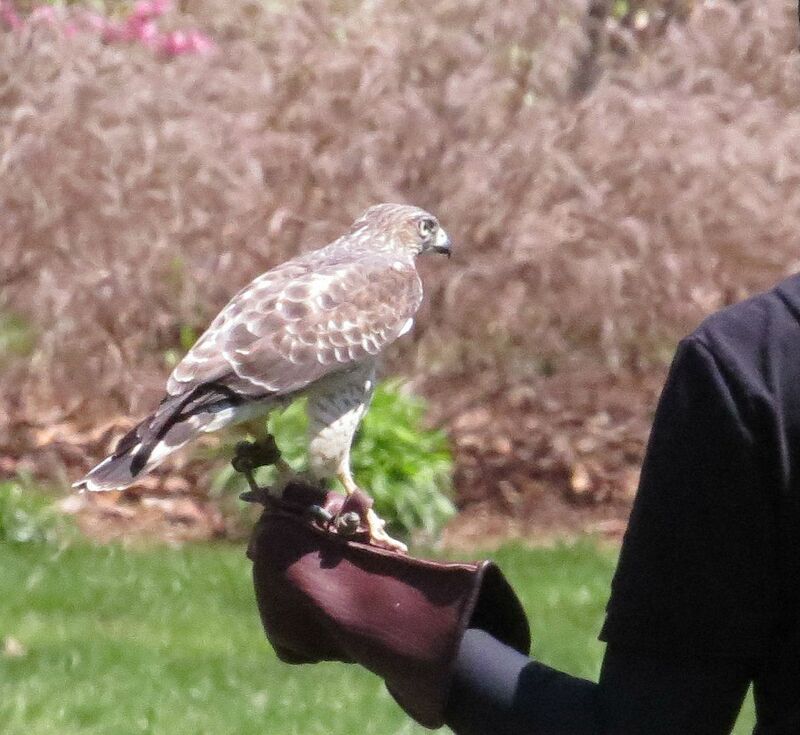 This was one of the few birds they let fly around. 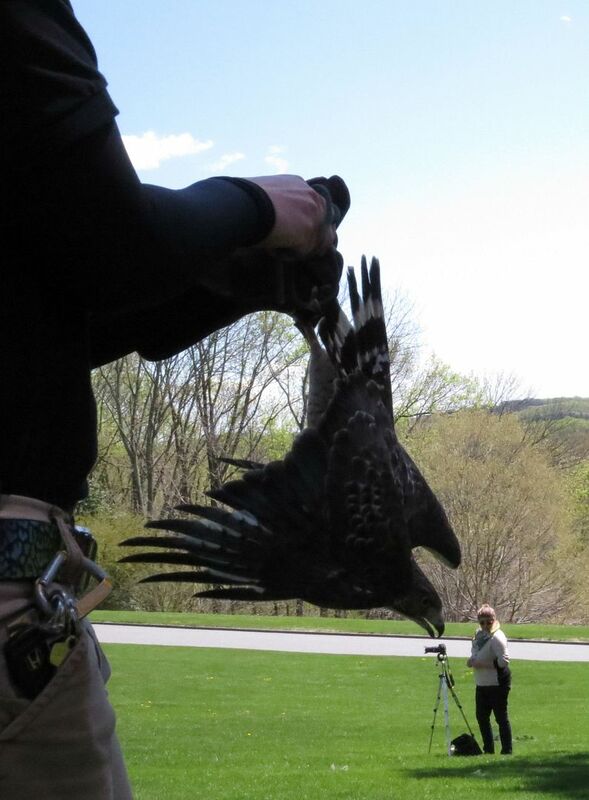 And it did a good job swooping from tree to tree and returning to its handler. 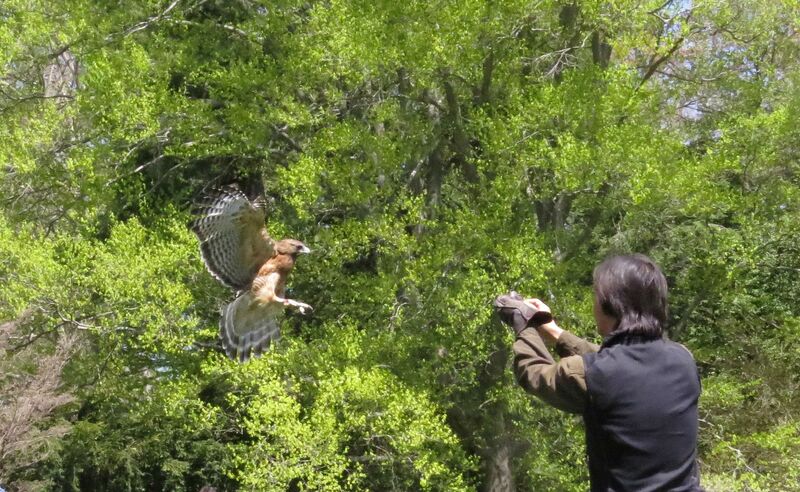 At one point he threw up a piece of food in the air and the hawk was able to swoop up and catch it. 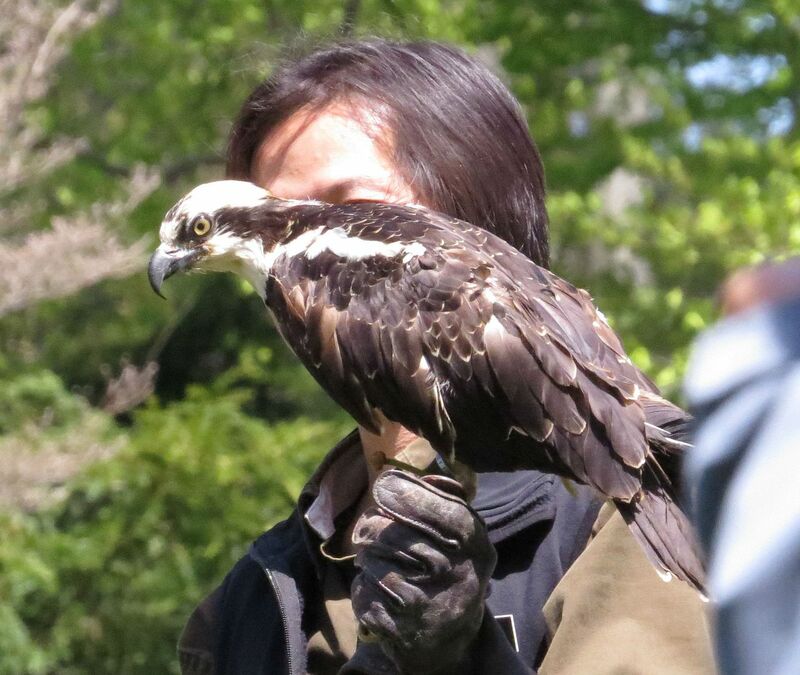 This is an Osprey which feeds exclusively on fish. Thus you only find them along rivers, bays and coastal areas. 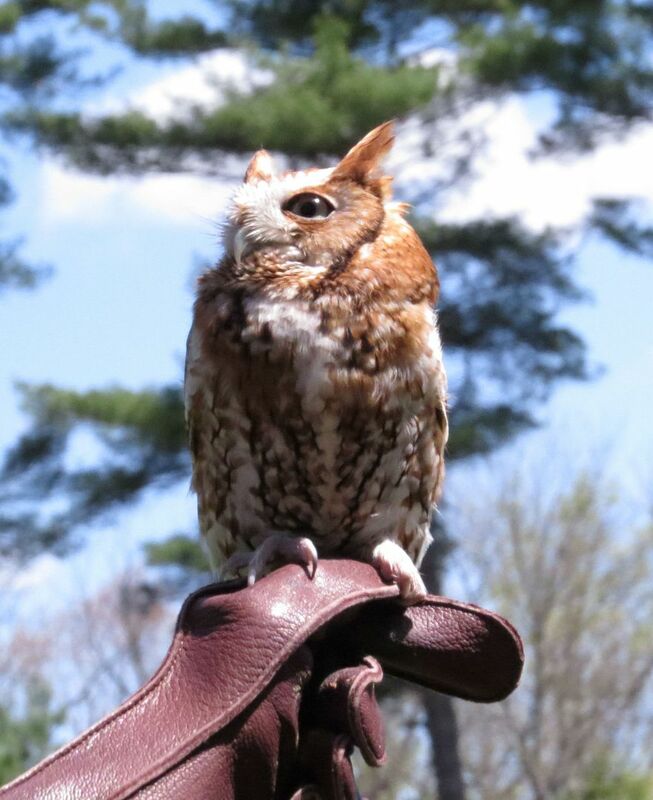 This was a Screech Owl. He was adorable. One lucky audience member was offered the best seat in the house. The Turkey Vulture glides extremely low to the ground. They allowed it to glide over the audience which was loads of fun. People kept ducking down but that just made him glide that much lower to them. 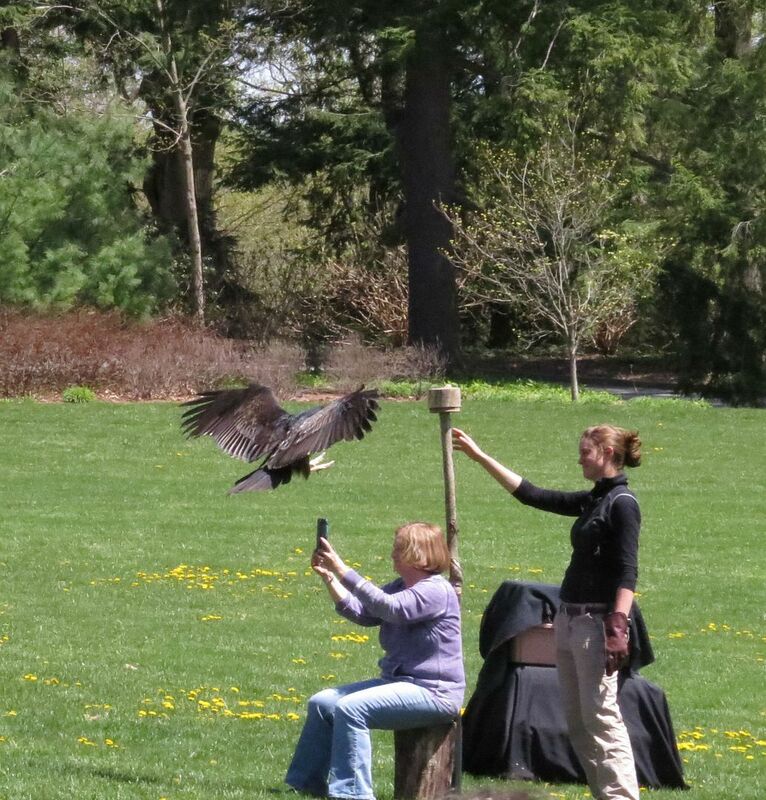 So this woman got to sit right in front of the perch the bird was called to and she probably got an amazing shot too. And then there's this guy. I forget what type of bird this is. Now for the majority of the time they had it out to talk, this is how he was, nice and calm on the trainers glove. But then I guess he wasn't comfortable with the crowd, and this may have been the first time he'd been in a crowd of this size, he just started to freak out and began trying his hardest to nose dive into the ground. He was actively flapping his wings to fly straight down at the earth. After the first spell of doing this he did right himself up again. But as they took him away from the people he began to act up again. And that's when he suddenly grew 50' tall, consuming a poor woman and her camera before being called off to once again save Middle-Earth and peck out the flesh of Prometheus for giving mankind the gift of fire. All and all I had a wonderful time.